Owing to our proficiency in this domain, we are offering our clients an optimum range of Canteen Burner. Baltur TBG 35 burner ranges from 80 to 410 kW. Low NOx and CO emissions gas burner compliant with European standard EN676 'Class III"
We have been counted amongst the most trusted names in this domain involved in providing Four Burner Gas Range. 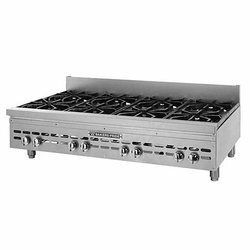 This Four Burner Gas Range is efficient equipment with 2 HP and 2 LP quality burners. Our product range is designed with stainless steel top, front panel in sturdy frame work. Furthermore, it is available in standard size that is 40 by 40 by 34. As per the needs and requirements of our clients, we are involved in providing Stainless Steel Gas Burner. 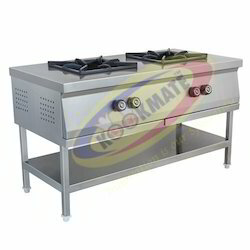 - Twin burner range with 1 hp burner & 1 lp burner frame ms, top & sides ss, cast iron pan support. We are a top notch supplier of Double Burner Gas Oven.